To be successful in real estate you need to be passionate about the business, understand the needs of your clients and above all be able to build outstanding relationships. This has been the cornerstone to the success of Diamond Realty, building long standing relationships with our client based on trust by referral. Our focus is to take the stress and complexity out of your Real Estate needs and make the experience as easy as possible. We guarantee it! Most real estate agents work in local areas and focus on controlling their own patch. In contrast, Diamond Realty operates from an office in Myaree and sells property throughout the metro area. Whether it is Commercial or Residential Real Estate the method and philosophy is the same. The Diamond Realty strategy is to work with local area agents to introduce a wider range of buyers to the property being marketed. The wider range of buyers creates a competitive environment for the seller and the result is the best possible price being achieved. We have an open policy to share our selling fees with other agents and this creates an environment that leads to other agents wanting to do business with us. This ultimately creates a benefit for the seller and the purchaser. It just makes sense! To achieve the best result, it is vital that the seller and the agent believe in the selling price. Diamond Realty’s approach to pricing is objective and based on quantitative evidence. Pricing strategy is based entirely on a comparative analysis of previous sales in the area and other properties currently for sale – being the competition. There is no bias based on unreliable ‘local knowledge’ or emotion. The philosophy of the company is to build a reputation to be price setters and not price takers and therefore always working in the best interest of our sellers. We believe that if we look after what’s best for our clients first and foremost then our business will flourish through the development of long term relationships. 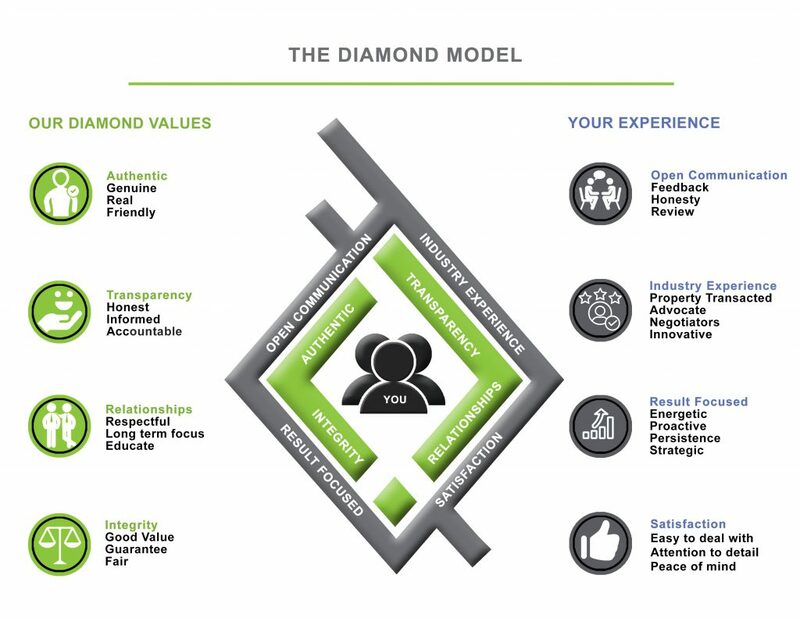 The Diamond Model represents the guidelines for who we are and how we approach our business. The core of the diamond are our values and the outer surface of the diamond is our business approach and dealings. The core signifies to who we are as individuals, and what Diamond Realty represents to us on the inside. This is the foundation and the glue that holds us together. We take pride in our authenticity in reflecting who we say we are with our transparency and trust in our dealings with you. It’s being respectful to your situation and what you need to achieve the result. Our level of integrity ensures that you will have all insights in the process. The surface of the diamond model is built around open communication and providing the honest feedback that you need. We bring industry experience and expertise to assist you in the most professional, ethical and beneficial way. We’re focused on results and building strong, trusted and mutually beneficial relationships. Our guidelines are built around you as the client and our focus is to take away the stress and complexity of your real estate needs to make your experience as easy as possible.